though i have been disappointed with most of the accessory designer collaborations target has offered i still find myself checking my calendar to see if i am going to be free on the day of their release. despite them picking some of my favorite makers of accessories (hello botkier, loeffler randall and gryson) the faux leather and poor stiching tends to weigh down all of the bags, and don't even get me started on the shoes. 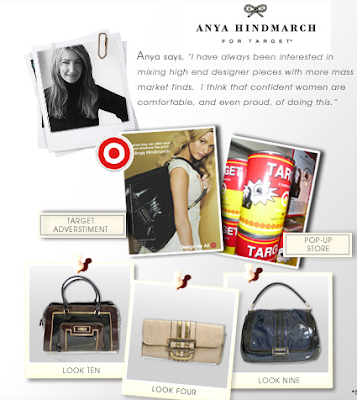 anyway anya hindmarch is debuting her collection on-line on the 8th of october and i will be there to check it out. it also hits store on the 12th which means i will mostly likely hold out on purchasing anything (assuming there is something to be purchased) until i see it in real life. you can check out the collection now here. Great collection. Got myself thinking I need a new bag!! You are so thorough, lady. Give us the report, please! um, what? Target has designer bags (and nice ones?!) thanks for the tip!